Lemon Square Inipit Crema de Fruta Recipe is an elegant, fruity cake dessert with jelly glaze. It is a popular dessert during Christmas. Thanks to Lemon Square’s Inipit, we can make this dessert anytime we want. There’s no need to bake a whole Sponge Cake for this or to hunt for special Broas. 2 pieces 3.5 x 5 Plastic Containers orany similar Container with a Lid. First, we need to prepare and measure all needed ingredients. Open a can of fruit cocktail and drain well, reserving the syrup for later on. Using a parchment paper measure the width of your container. Use the parchment as your pattern to pre-arrange the fruits that you want to put on the top of your cake later on. Use a small sharp knife to trim the fruits to make even cuts. Lay them flat on the pattern so you can create a mosaic design. Roughly chop the remaining fruits and set aside. Let’s prepare our custard filling: In a small saucepan, combine sugar, all-purpose flour, milk and water. Mix until sugar and flour dissolves and there’s no lumps. Heat the mixture over low heat, stirring continuously until becomes thick for about 5-8 minutes. Take off from the heat, add egg yolks, one at a time and whisk until well blended. Heat the custard cream again, over low heat for about 3-5 minutes. Fire off, stir in butter and vanilla extract and stir until well blended. Set aside the custard cream and let it cool completely. Open 10 pieces of Queso Inipit and separate each cake sandwich and place it in a tray and set aside. Using your prepared container, arrange Inipit by arranging them flat, covering the entire bottom of your container. Using a reserved fruit syrup, spoon and drizzle over the cake just enough to moisten. Cover the cake layer with custard cream and spread to even the top. Scatter some fruits on top and flatten lightly to create a flat surface. Top with the second layer of Inipit and arrange them flat. Spread last layer of custard cream and spread evenly. Decorate the top with your pre-arranged fruits, lay them even and neat as you can. After you’re done with your layering, chill the cake and let’s make a jelly glaze. In a small saucepan, combine unflavored gelatin, sugar and water, stir and bring to a simmer. Simmer just enough to dissolve the sugar and gelatin powder. Lastly, cover the cake with jelly glaze on top and chill for about an hour to set the custard cream and jelly glaze. Serve and enjoy your homemade Inipit Crema de Fruta. 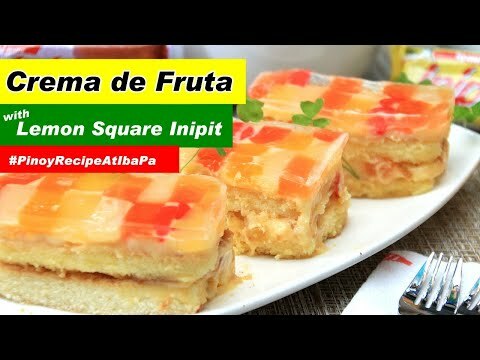 Lemon Square Inipit Crema de Fruta Recipe try is quick and easy to make Filipino dessert using an alternative ingredient, Lemon Square’s Inipit. This sounds absolutely delicious! Thanks for the recipe.